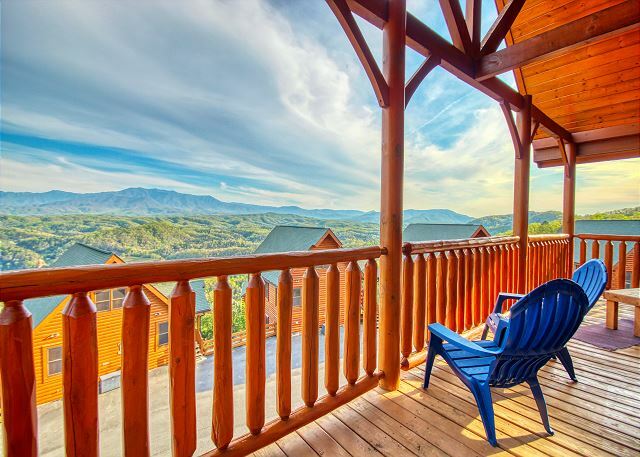 Location: Legacy Resort in Pigeon Forge, TN (just 2 miles from Dollywood, Splash Country, & Golf Course) This amazing luxury cabin rental has one of the very BEST mountain views you will find in the Smokies! NEWLY ADDED 60+ GAME VIDEO ARCADE! 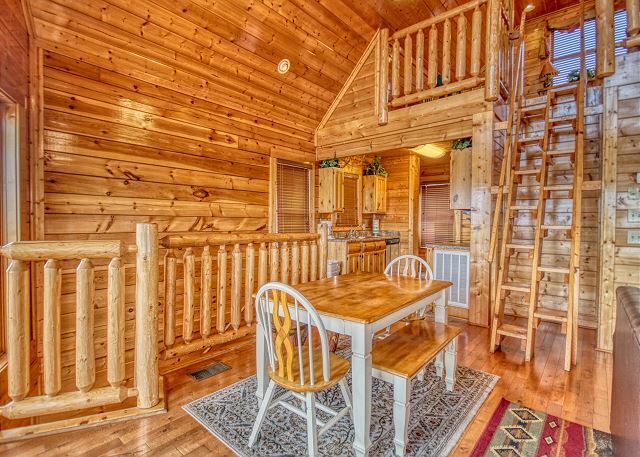 This Large luxury cabin rental is offered in Legacy Resort just 2 miles from Dollywood. Enjoy one of the True treasures of Tennessee! 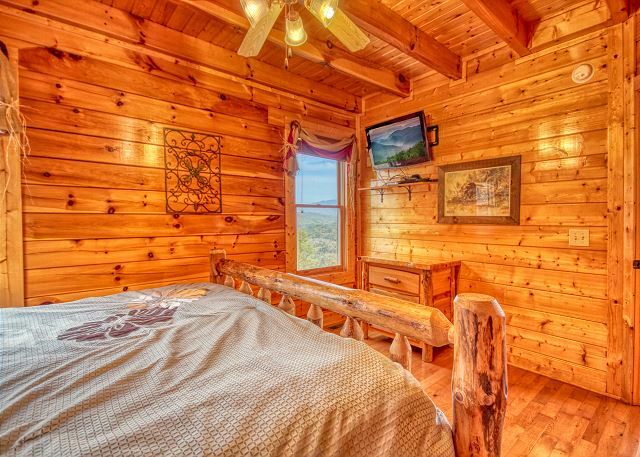 This beautiful log cabin has 2 king beds and 1 queen bed. 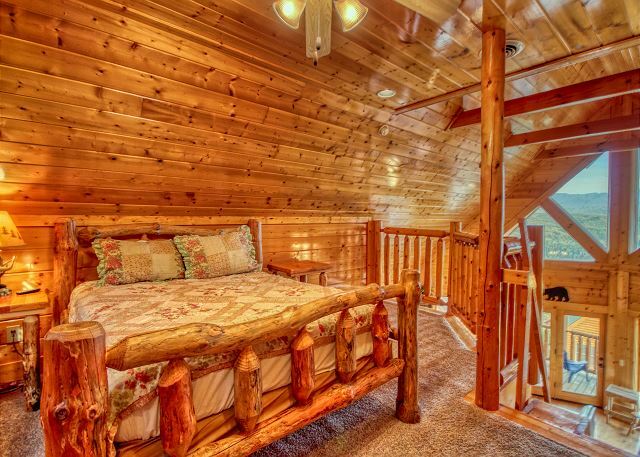 This Amazing log cabin is luxuriously decorated from the loft bedroom to the bottom floor! 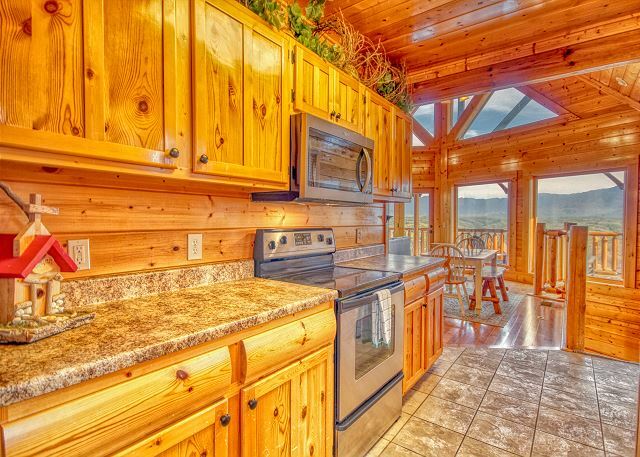 Your entire group will be impressed with the vacation resort, fabulous views, and pristine cabin decor. 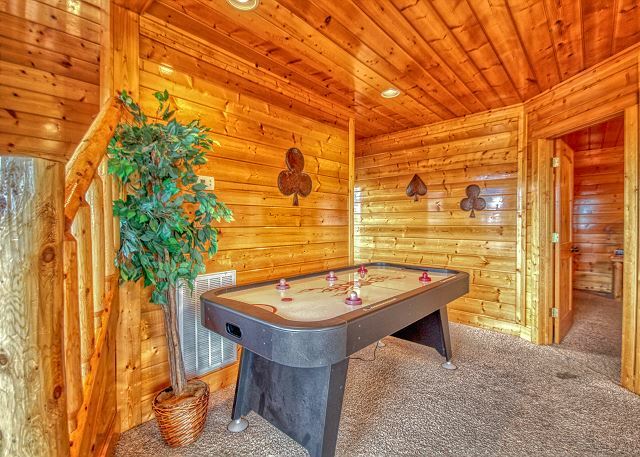 Everyone will enjoy the gameroom which offers a flat screen TV, pool table, and air hockey table. 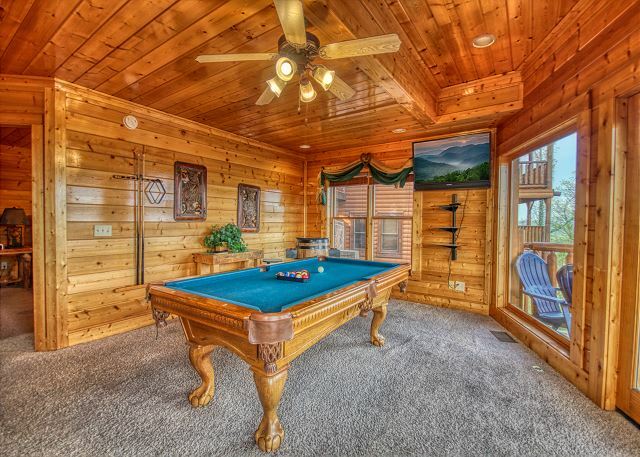 Relax in your outdoor hot tub or indoor jacuzzi at Tennessee Treasure. Internet lovers will be able to use the cabin's WiFi anytime. Also, Enjoy the astonishing mountain view from your rockers on the outside deck. 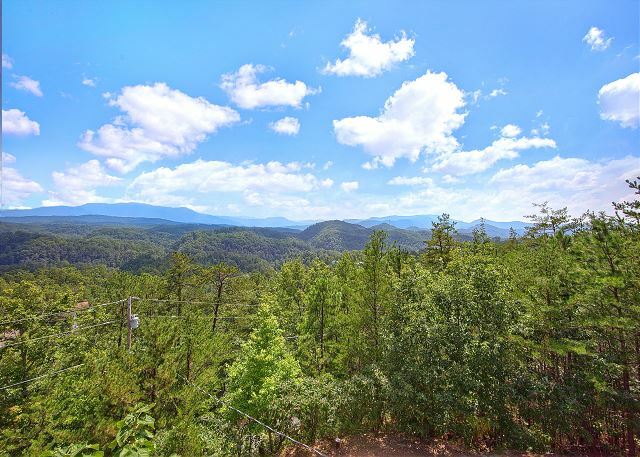 Make this beautiful Smoky Mountain cabin your Tennessee Treasure today! 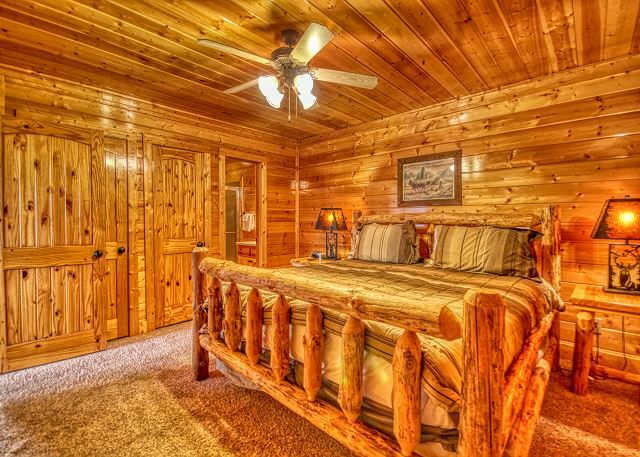 This log home offers log beds for its special guests. Have lunch at the lodge's outdoor picnic table or indoor dining area. This cabin will leave you saying, Wow! from check-in to check-out, so book Tennessee Treasure today Located off Upper Middle Creek/ East of Light #8 Pigeon Forge Parkway. Price is based on 4 adults, each additional adult is $12.50 per night. Sorry, no pets or smoking here. We loved everything about this cabin and definitely plan on going back. My grandson couldn’t get enough of that loft and ladder! The only thing that was a downer was the pigeon poop and feathers right at the front door. But, we would definitely go again!! This cabin was perfect! The views out of the back window are incredible!! The cabin was roomy and accommodating and very cozy! Only 2 minor complaints: trash didn’t get picked up while we were there, so it piled up quickly out of the outside trash can, and there weren’t enough towels. Other than that, perfect! Loved the cabin. Very nice, clean, comfortable, and great view. The game room add something to do while at the cabin. Kids loved it. Lot's to do close by. Would stay here again. Our family summer vacation was wonderful. We rented our cabin Tennessee Dream from Aunt Bug’s cabins. The cabin was on top of the mountain with amazing views! We had both sets of grandparents and our 12 year old son. The cabin was clean, full of windows and very comfortable. I was pleasantly surprised since I did book online. I would love to rent the same cabins next year. Thank you Aunt Bug’s for giving us a wonderful experience camping in the Smokies! We will be back! We had planned on spending time in Hilton Head, SC but had to evacuate due to Florence. We were so lucky to have found this place. It was spotless and comfortable and we were able to relax and enjoy ourselves. Easy check in and great location. The cabin was nice and cozy with all amenities. The view was awesome especially the early morning sunrise over the hills with the fog still in place. The only thing which felt out of place in the cabin is the outdated rear projection TV. Other than this everything was fine. Family of 8 came for three nights. Really enjoyed the pool table, air hockey, and hot tub! View was beautiful! What a fantastic place to stay. Close enough to be convenient, far enough away to avoid crowds. The view exceeded all expectations. Mt LeConte looked incredible and the sunrises were unforgettable! This cabin lived up to every expectation I had! It was located in an amazing area, minutes from the main highways and attractions. 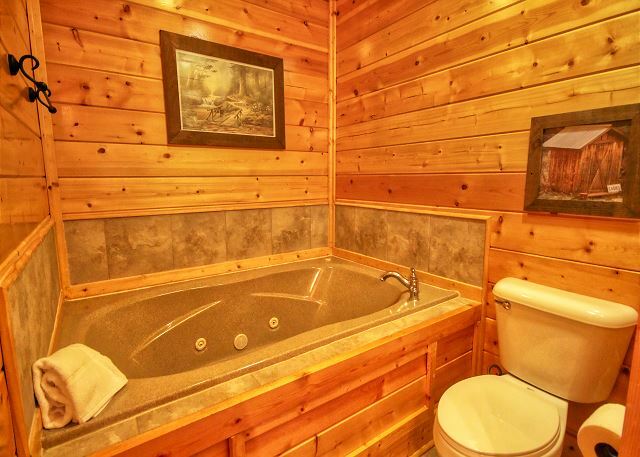 The pictures that I viewed on the rental site matched what I saw when I walked through the door. The views were spectacular! There was plenty of natural light the greeted us everyday, and it was no trouble getting in or out of the property. The rental company was also very friendly and helpful. They had an answer to every question we had. Would definitely stay here again in the future! It was a beautiful view every morning from the very top of the mountain! The cabin was very beautiful beds were comfortable! The cabin is beautiful. The carpet down stairs needs replaced. It is soiled and has lumps in it. It is not safe. TV in all rooms except living room did not work. But I didn't go there to watch tv. Everything else was very nice. Would rent again. Excellent Stay. Great Cabin, Wonderful workers at Aunt Bugs. Everything was as expected. 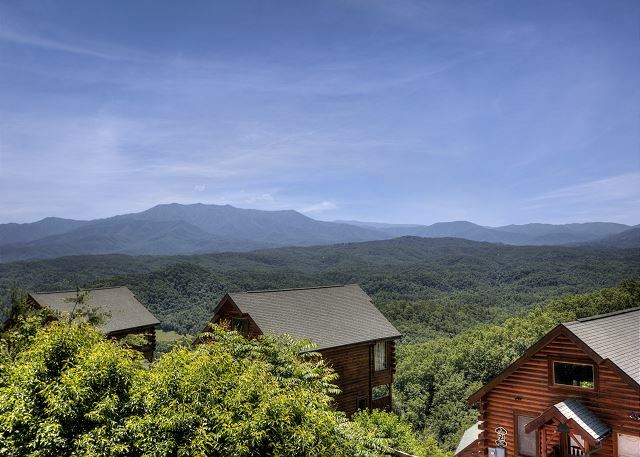 If you are looking for a place to stay in the Smokies, PLEASE, STAY HERE. The view is breathtaking, the cabin is clean and roomy. It's at the tippy top of the resort, so you have an amazing view. This cabbin Tennessee Treasure is pretty much at the top of the Legacy Resort with only a few more cabins located higher, the view off the the 2 porches are breath taking, and we were blessed with great weather so we had the chance to watch the sunset from the community pool area and the sunrise from the cabin deck. 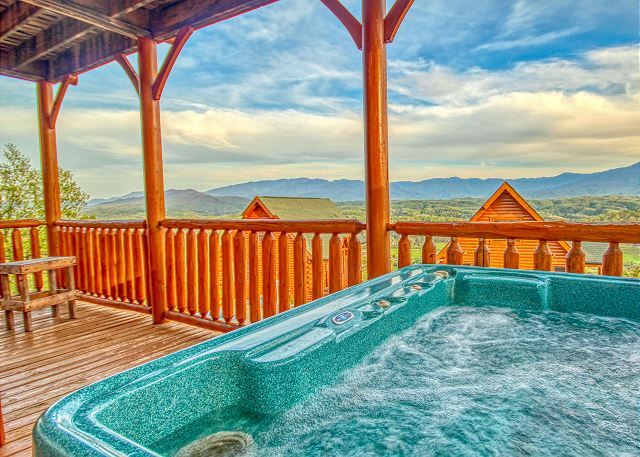 We also used the hot tub at least 3 times that easily fit 2 adults and 2 kids and the experience was unique because of the view.....how many places in the world can you sit in a hot tub and see a fabulous view of the smokey mountains? 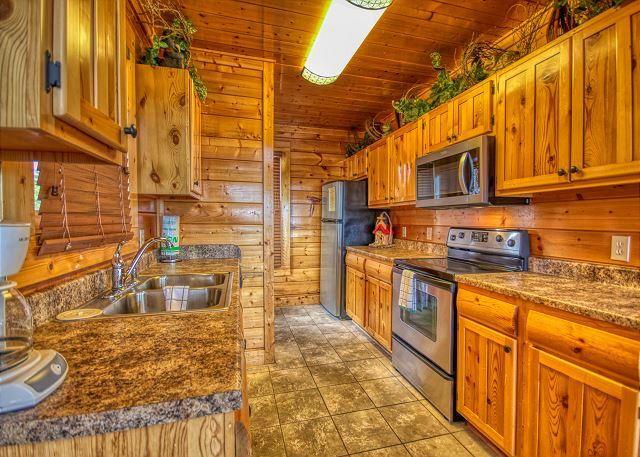 The layout inside this cabin was spacious with several tv's, a nice dining area, comfy furniture, comfy beds, and a working gas fireplace which we enjoyed a few times. We even had a pizza place that delivered. 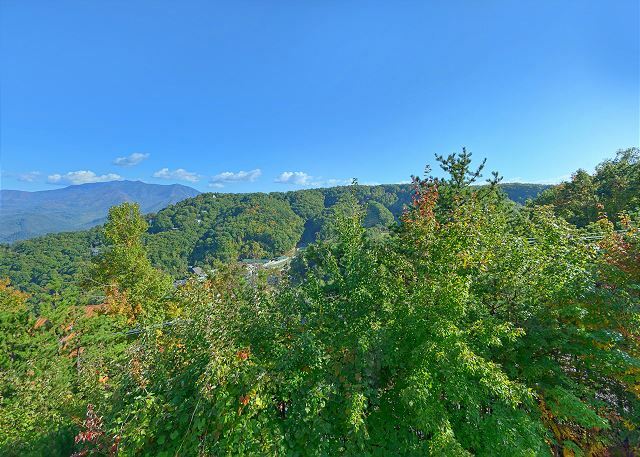 This cabbin location was very close to Pigeon Forge and Gatlinburg and these 2 places offer so much to see that its like being in Las Vegas espically at night....everything is lit up....tons to see and enjoy and there are so many restaurants that what ever your craving you will find. 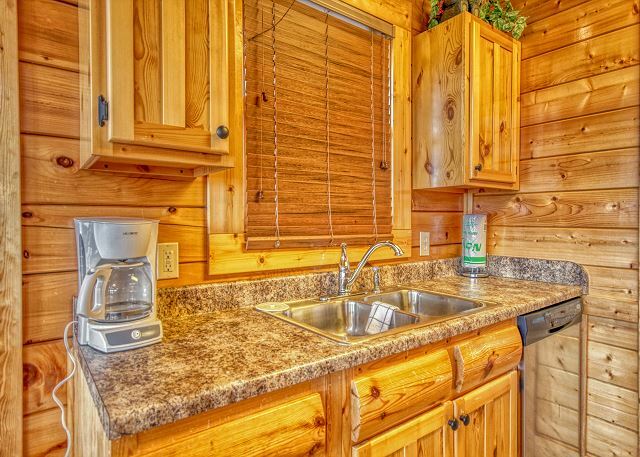 My family's cabin rental experience was truly like renting a home away from home and Aunt Bugs made our experience convenient with easy check in and out procedures with checking in very quick and easy. The cabin was breathtaking and views were even better. There was a bee/wasp problem outside (we had a can of wasp spray so it's been an issue) but early morning/early evening they didn't bother us and we weren't home during the day. The cabin wasn't the sanest. They're were pop cans left in the loft up stairs, food crumbs in the cabinets, and very dusty all over. Nothing horrible, but when you pay for housecleaning, you would think big items (pop cans) would be disposed of. We would definitely come back again! Aunt Bugs staff is very nice. The cabin is beautiful.pictures does not do justice. Few things didn't work like TV in loft are main floor bdr.carpet down stairs needs replaced. Would rent again! Very, very nice. Such a beautiful spot. The porch had loose nails, the fans all had large chunks of fuzz and lint on them; all the bathroom lights were fuzzy; huge ball of bugs in the large picture windows. Other than that; it was beautiful. I would stay there again! From time we checked in until the day we checked out, it was absolutely amazing! The staff was very helpful, and showed great hospitality. The cabin was breath taking, and we are planning our next year's trip already. The entertainment in downtown Gatlingburg, was family oriented, and also great if you were on a girls trip, guys trip, or even an Honeymoon. So far this was hands down the best vacation ever. We loved staying at the cabin! This was our first visit to the area and we will be back! The cabin was beautiful, clean, spacious and with stunning views. Very peaceful and calm....a perfect venue to celebrate Easter! It was a beautiful cabin. There was limited cable channels in some rooms. Maybe all rooms can be upgraded with all channels. Otherwise, it was a fantastic stay! Had a fantastic time. Will be back very soon. Great cabin, great view. Close to everything. Fantastic! Wonderful place to stay overall. Magnificant view of the mountains. Would definitely recommend it!! The cabin was so nice. It was clean and very enjoyable. We will definitely be coming back. A kitchen chair was broken. Lots of cobwebs. Chair on porch on main level slats on one nail almost out and slat moved up and down. Love It and will be back! Never got in a hurry to go anywhere because we enjoyed the activities there at the house! Only complaint was bathroom on gameroom floor stayed very cold and we had to run a hairdryer when bathing to stay warm. Will bring a little heater next time. It was our first time staying in a cabin. Enjoyed it very much, especially my kids. The view was so BEAUTIFUL!! We are already making plans to go back. But this time we are going to stay a little longer. All was well. I wish the pool table and air hockey were in better shape. But all in all it was an enjoyable trip. The cabin met my expectations. The view was more than I thought it would be from inside. The staff was extremely nice and thorough. They worked very fast on a few issues we had and did it with a smile. I would definitely rent from there again. Relaxing, fun and an amazing view! Kathy handled our check in and come to find out she was also who I had booked the stay with by phone in January. She was as helpful and informative by phone as she was in person. Cabin was clean, view was unbelievable, there were several light bulbs burned out and the hot tub was not working on arrival but one call to maintenance and the hot tub was fixed before we got back to the cabin that evening. Awesome time enjoying our stay. Hot tub, view, shopping and wine tasting. Thank you for a perfect weekend get away. 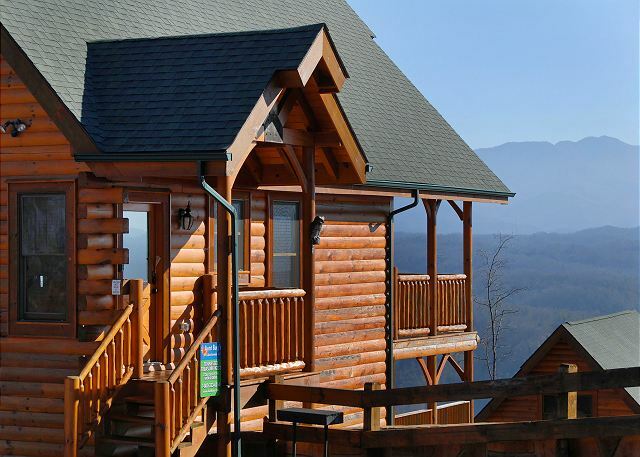 Great view, wonderful cabin, everything is better than expectations. Cabin was good. Didn’t need anything. View was great. Sheets could have fit mattress better. Views were spectacular! Other cabins were must closer than expected and no real outdoor space to enjoy in the cabin area, but it still was quiet and relaxing. Cabin was comfortable and well-stocked, other that less towels than guests staying and needed a cookie sheet of some kind. We enjoyed our stay in #232 TN Treasure and would recommend to others. Excellent customer service. Beautiful home. Very nice and clean. Loved it !!! Loved the cabin and loved the view! Kids loved having the game room especially on the days it was raining! We very much appreciated the ease a book in the kablam with and bugs cabin rentals. The cabin was lovely Thank you! We loved the cabin! Everything was clean and the view was amazing! Absolutely stunning views of the mountain. We loved staying here. The bedrooms are very spacious and comfortable to sleep in. Our daughter loved staying in the loft. We found the living room sofa not too comfortable, but it was ok. The pool is very nice and a very short walk from the cabin. The hot tub was nice and relaxing. The buttons were a bit worn and tricky to get started at first, but figured it out. The staff here are very helpful and super friendly. The game room was fun, but only has a small bench for a sitting area and would be nice to have more options to sit and hang out. Cue sticks are very worn,no tips, so if you have your own bring it. The game room had a very nice TV, but no cable box. We had to connect a box from another room to get working cable to the game room. Also would be nice to have like a high top table and chairs for morning views on the balcony along with the rockers that are already there. Great staying at cabin. No problems. We would stay again. Cabin was very clean. Staff was friendly and the view was amazing. Great cabin, beautiful view, family thoroughly enjoyed it! Teenagers really enjoyed pool table, air hockey, and hot tub! Nice. Comfortable, good view. I will be back. Want to zipline the mountain. Perfect! Wonderful customer service, the cabin was exactly as represented. It was clean and in good repair. I appreciated the little extras like the helpful app and the coupons. We will definitely rent from Aunt Bug's again! Thank you for making my birthday weekend get away awesome! Everyone was very helpful and friendly especially Kathy during both making our reservation and our check in. Cabin was awesome top to bottom. THE VIEW WAS INCREDIBLE!!!! Great view, lovely cabin, relaxing and fun. Would stay Again. The office personnel were very professional, welcoming, and thorough. They wenT ouT of their way to make us happy.